Incentive programs are seen as a major aspect of most corporate wellness programs. Dr. Jon Robison, co-author of the book HOW TO BUILD A THRIVING CULTURE AT WORK says that these (extrinsic) incentive programs don't work. "Amazingly there is scant evidence that these types of extrinsic motivation effectively achieve any of the health outcomes targeted in typical workplace wellness programs." He points to the now infamous "Safeway" study, which prompted a "wellness amendment" to the Affordable Care Act. 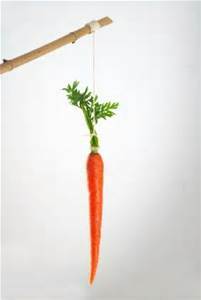 This wellness amendment says it's OK for corporations to use reasonable incentives (aka carrots) to promote healthy behaviors and even dis-incentives (aka sticks) to reduce unhealthy behaviors. Rewarding employees who quit smoking and charging smokers up to 25 percent more for their health benefits package (or even occasionally deducting money from their salary), would be an example of incentives and disincentives. "After weeks of vociferous objections by faculty members, Pennsylvania State University said on Wednesday it was suspending part of a new employee wellness program that some professors had criticized as coercive and financially punitive." "In particular, the university said it was suspending a $100 monthly noncompliance fee that was to be levied on employees who declined to fill out an online questionnaire. The form, administered by WebMD Health Services, a health management company, asked employees for intimate details about their jobs, marital situation and finances. It also asked female employees whether they planned to become pregnant over the next year." Various Sides of the Argument. While I was at the AJHP conference this year (2015) I was talking to one wellness professional who described the fine an employee would have to pay (at the company where he worked) for NOT getting an annual physical. In other words, his company took the stick approach. Like the Penn State employees described above, there was one employee at this company who strenuously objected to being financially coerced to see a doctor. BUT when his doctor caught a cancer in its early stages this employee was of course REALLY grateful the plan had forced him to see a doctor. Ron Goetzel, wellness expert, assures us in his blog that when these incentives are used in the right way (for example, not used to punish people who CAN'T do the required behavior change) and are awarded in just the right amount, (not too much and not too little) somewhere between $500 and $750 annually, that yes, these programs will work. Robison doesn't really draw a distinction here and says that for behavior change to work in the long run it has to be "intrinsically motivated." In other words, people have to WANT to make the change. (For more on the differences and nuances between intrinsic and extrinsic motivation, see this article). "While the value of employees who are invested in their own well-being cannot be overstated, expecting them to make significant and sustainable behavior changes without the necessary resources and support is unrealistic and serves as nothing more than a thinly veiled attempt at cost shifting". I happened to sit down for breakfast on the second day of the AJHP conference with a woman who works at a homeless shelter in Baltimore. The shelter gets all kinds of grants to incentivize healthy behaviors on the part of the various homeless people who use it. She said that to some extent, the incentive program has backfired. "Now I can't get them to do anything without paying them to do it first." She talked about what a struggle it was to launch an art-therapy program or to get them to take certain bio-metric screenings (like an AIDS test) without paying for them to do it first. I personally have always leaned toward the intrinsic motivation side of the debate. In my programs I teach trainers to emphasize short-term gains over the long term gains. The research tells us that telling people they are going to live longer doesn't really motivate them. This business of wellness -- and for me this means teaching people how to manage stress -- is all about feeling better today. Dr. David Katz basically said the same thing at his AJHP keynote speech. When you start eating better you start feeling better - right away. That's intrinsic motivation. You may live longer as THE RESULT of eating better and managing your stress, but that's not an intrinsic motivator. Feeling better TODAY is.